Considerable cloudiness with occasional rain showers. High 53F. Winds WNW at 10 to 20 mph. Chance of rain 60%..
Cloudy early with partial clearing expected late. Low near 45F. Winds NNW at 10 to 20 mph. 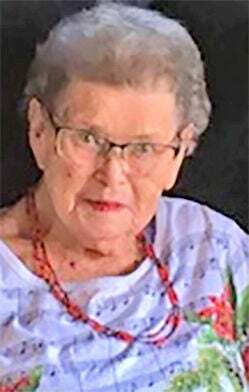 NASELLE — May Florence Adair, age 90, died at home in Naselle, Washington on Jan. 10, 2019. Services will be at the Naselle Assembly of God Church on Saturday, January 26, 2019 at 1:00 p.m. Private interment will be at the Peaceful Hill Cemetery in Naselle. May was the daughter of Wilho F. and Aili Lindstrom Saari and was born at home in Naselle. She attended Naselle High School and graduated in the class of 1946. She and H. Robert “Bob” Johnson were married on Aug. 26, 1950. They ran a Grade A dairy until 1966 on their farm in Rosburg. In the mid-1960s, May began working for the Department of Juvenile Rehabilitation at Naselle Youth Camp. She worked as the school secretary for the Naselle Youth Camp School until she retired in 1990. Following the passing of her first husband in 1991, May married Robert “Bob” Adair on May 10, 1997. They lived on Mill Ranch Road on the Lower Naselle River and were married for 21 years. May was well-known for her musical talent. May played the piano, organ, accordion, kantele, and numerous other instruments. She was the church pianist at the Naselle Assembly of God Church for many years and supported other congregations in need of those skills. She played for numerous weddings, funerals, and Naselle High School baccalaureates including her own. She also taught piano for over 60 years. May treasured her Finnish heritage and pursued the study of genealogy. She loved exploring her own roots but also enjoyed collaborating with others in researching their family heritage. She was a regular presenter at the Finnish-American Folk Festival in Naselle and was one of the founding members of that organization. You could always find May in the Genealogy Room surrounded by her copius research and displays. Hospitality was another of May’s many gifts. She enjoyed serving large crowds in her home and at church. It was not uncommon to serve 25 to 30 family members at Thanksgiving or Christmas. No meal was complete without a variety of her home-canned pickles. She could be counted on for a main dish and a dessert, usually her apple cobbler, for any church function. May was a woman of deep faith, and her life reflected her love of the Lord in all her pursuits. She especially had the desire to pass her faith to her family and to all she knew. May truly was a good and faithful servant. May is survived by her husband, Bob Adair at home; brothers, Leo (Mary) Saari and Wilho Saari of Naselle; a son, Robbie (Marilyn) Johnson of Waitsburg, and daughter, Sharon (Sandy) Ross of Rosburg. May’s stepchildren include Dewey (Kate) Adair of Raymond, Lillie (Rex) Shetler of Vader, and Carl (Anita) Adair of Renton. Grandchildren include Serena (Drake) Travis, Cherilyn (Michael) Phipps, Vanessa Leamy, Travis Shetler, Jacob (Diana) Shetler, Amanda (Rick) Shetler-Miller, Dustin Adair, Dillion Adair, Arthur Adair, and Bryon Adair. May had 18 great-grandchildren and three great-great-grandsons. She also had many cousins, nieces and nephews. May was preceded in death by her parents and her first husband, Bob. In lieu of flowers, memorials may be given to the Naselle Assembly of God (Youth Camping Fund), the Finnish-American Folk Festival of Naselle, or to the charity of the donor’s choice directly or through the Penttila’s Chapel by the Sea, P.O. Box 417, Long Beach WA 98631. Her guestbook is available at www.penttilaschapel.com.